Legalize the so Called “tolerated » refugees in Germany! Discussion, networking, meeting and eating in the evening. While we await any attempt to force us into imprisonment as we excise civil disobedience against Apartheid “Residenzpflicht”, we shall embark on a Tour all over Germany to damask the repressive policies against Refugees in Germany. The Tour will serve as a platform for exchange amongst Refugees with a critical view to the 2015 deceptive Asylum “relief” in comprehensive relation to the horrific Asylum “Compromise” of 1993 up to the hypocritical decision of the German Federal Constitutional Court in 2012. 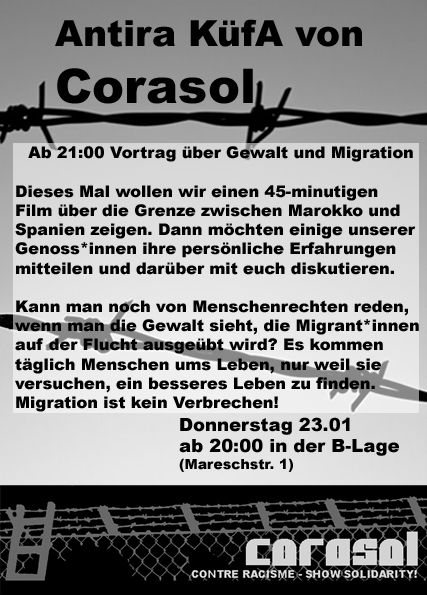 In this tour, refugees will be informed about the “Adverse faces of Germany” enforced through arbitrary powers at different levels, the system of Refugee Isolation and control, the continuous exploitation of Refugees here and beyond the borders of Europe. Their propaganda is built on the grounds of ignorance of a “civilized” society and at the expense of Refugee’s human dignity. Now is the time to mobilize Refugee’s solidarity and empower networking within our communities through the intimate understanding that we all face the same problems – even though the situations might appear to be different. Our experiences have confirmed that nothing good can be expected from Imperialist States like Germany except by direct confrontation and scandal. As your responsibility to support the revolution of the oppressed you should mobilize refugees and organize discussion events in your region. Announce your dates so as to enable us plan our schedule. We will be glad to join you for exchange. « Do All Women Have Equal Rights? DJ dr. k // queerbeet–move your feet! Respect! will report on the situation of illegalised women workers in the city of Berlin, on their surviving strategies & their collective organization. The Women’s Space will tell you what it takes to access medical care & family planning in the conditions of isolation imposed by the « bush Lagers » & by the bureaucratic rule of our lives. We will explain what it means to be a mother in exile, struggling for the right to a self-determined life & to education, for ourselves & for our children. We will also try to tell you what it takes to relate to our female bodies, while being forced to live in a crowded, filthy Sammelunterkunft*. In March, we demonstrate twice! On March 8, for women’s rights & for their visibility. 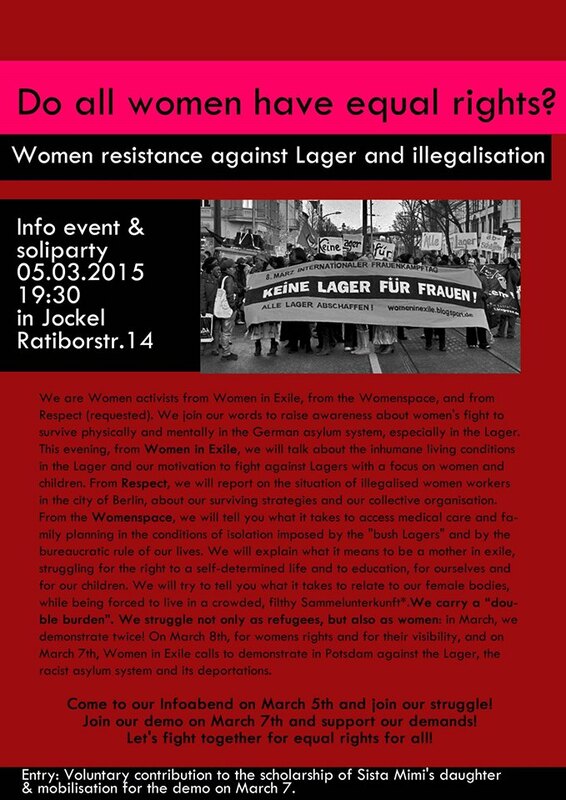 On March 7, Women in Exile call to demonstrate in Potsdam against the Lager, the racist asylum system & its deportations. With the funds raised by the info event & party on March 5, we want to continue our friend & fellow activist Sista Mimi’s support for her daughter’s education. We lost her last December after 20 years of human rights activism in Germany. Women in Exile will talk about the inhumane living conditions in the Lager & our motivation to fight against it with a focus on women & children. On this occasion, funds will be raised for the group’s work.